No medieval images of Cynog are known and modern depictions are unusual, with examples in churches at Brecon and Defynnog. 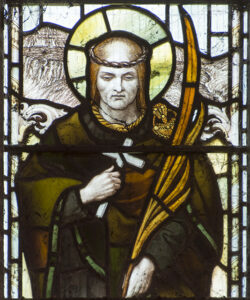 At Brecon Cathedral Cynog is depicted in a stained glass window with further local saints Brychan and Alud. The window by Powell & Sons has some individuation, and Cynog wears his famous torc and has a fine penannular brooch, while holding a cross and a martyr’s palm. There also appears to be some approximation of the local landscape in the background of the window.